I'm struggling building a People search page, everything is going great until I want to use AD "Office Location" information (Which we all have setup already, see the orange box in the screenshot) as a filter. 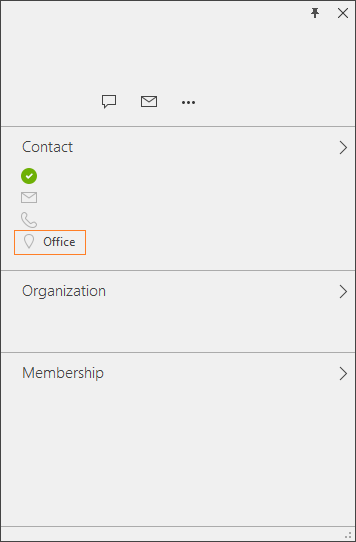 If I type the office on the search box I can find everyone I'm looking for but you know how it is for end users, the less input the better and because of this I'm trying to add the "Office Location" as a filter, with no luck. People:SPS-Location, which brings information that users input and it's not useful for this exercise purpose. I've also tried mapping People:Office to a RefinableString, no luck. Searched for the love of my life... no luck. The property is there, it's being searched and brings back the information for "Office Location" as I type it, but I can't seem to figure out how to pull that as a refiner. Any help will be greatly appreciated! Apparently I had to wait for a crawl to happen (As this is on SPO we can't control that) as now it's working. Mapping the Crawled Property "People:Office" (Description field Office or attribute physicaldeliveryofficename) to a RefinableString. Wait a full day... or 4! (I made the change Monday and it didn't reflect until today Thursday) for the Crawl to happen. I hope this helps those of you out there tasked with making a phone book kind of search in SharePoint. Edit: It's been over a week and the crawl is still being updated, each day more people show up for each section, it's a slow process and if you are working on this you should let your interested parties know that it's not something that will happen in a week. Not the answer you're looking for? Browse other questions tagged sharepoint-online search filter enterprise-search spo or ask your own question.